Preface. Acknowledgements. Introduction. 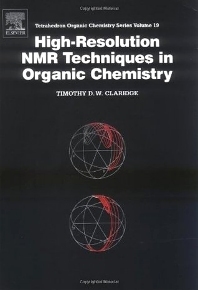 The development of high-resolution NMR. Modern NMR and this book. Applying modern NMR techniques. References. Introducing High-resolution NMR. Nuclear spin and resonance. The vector model and pulse excitation. Time and frequency domains. Spin relaxation. Mechanisms for relaxation. References. Practical Aspects of High-resolution NMR. An overview of the NMR spectrometer. Data acquisition and processing. Preparing the sample. Preparing the spectrometer. Spectrometer calibrations. Spectrometer performance tests. References. One-dimensional Techniques. The single-pulse experiment. Spin decoupling methods. Spectrum editing with spin-echoes. Sensitivity enhancement and spectrum editing. Observing quadrupolar nuclei. References. Correlations through the Chemical Bond I: Homonuclear Shift Correlation. Introducing the second dimension. Correlation spectroscopy (COSY). Practical aspects of 2D NMR. Coherence and coherence transfer. Gradient-selected spectroscopy. Alternative COSY sequences. Total correlation spectroscopy (TOCSY). Correlating dilute spins: INADEQUATE. References. Correlations through the Chemical Bond II: Heteronuclear Shift Correlation. Introduction. Sensitivity. Heteronuclear single-bond correlation spectroscopy. Heteronuclear multiple-bond correlation spectroscopy. Traditional X-detected correlation spectroscopy. References. Separating Shifts and Couplings: J-resolved Spectroscopy. Introduction. Heteronuclear J-resolved spectroscopy. Homonuclear J-resolved spectroscopy. "Indirect" homonuclear J-resolved spectroscopy. References. Correlations through Space: The Nuclear Overhauser Effect. Part I: Theoretical Aspects. Introduction. Definition of the NOE. Steady-state NOEs. Transient NOEs. Rotating-frame NOEs. Part II: Practical Aspects. Measuring steady-state NOEs: NOE difference. Measuring transient NOEs: NOESY. Measuring rotating-frame NOEs: ROESY. Measuring heteronuclear NOEs. Experimental considerations. References. Experimental Methods. Composite pulses. Broadband decoupling and spin-locks. Selective excitation and shaped pulses. Solvent suppression. Recent methods. References. Glossary of Acronyms. Index. For chemists, spectroscopists and NMR laboratories. Dr. Tim Claridge graduated in Chemistry and Analytical Science from Loughborough University of Technology in 1988, having also spent an industrial year at, what was then, Beecham Pharmaceuticals. This period germinated his early interest in NMR spectroscopy as an analytical and structural tool, and subsequently led to the completion of a D.Phil at the University of Oxford with the late Andrew Derome. Since 1992 he has been the NMR Facility Manager in the Dyson Perrins Laboratory at Oxford where his interests focus on the application of solution-state NMR techniques to address problems of structure and mechanism in a wide variety of chemical and biochemical systems. He currently serves on the committee of the UK Royal Society of Chemistry NMR Discussion Group.